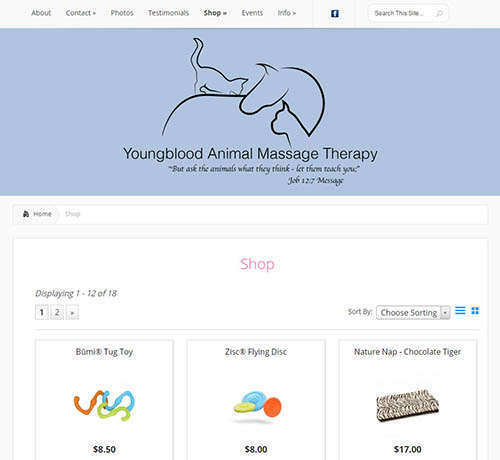 We just recently added an e-commerce shopping cart WordPress plugin to the Youngblood Animal Massage website. Youngblood Animal Massage is located in Greenfield, Indiana. Visit their website at www.YoungbloodAnimalMassage.com. Oongawa Design can help you with your Greenfield Indiana website needs. 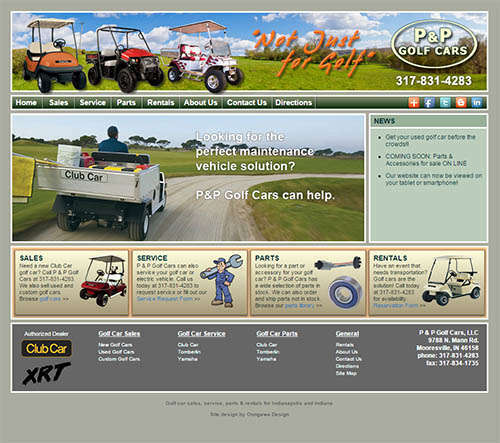 The website for P&P Golf Cars (www.pandpgolfcars.com), located in Mooresville, Indiana, is now mobile-ready. Oongawa Design specializes in responsive web design. 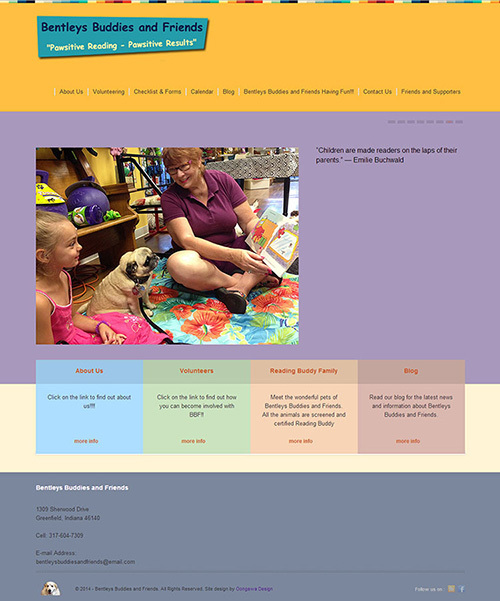 Our newest web design is for Bentleys Buddies & Friends, a non-profit organization in Greenfield, Indiana. The Bentleys Buddies & Friends program provides reading buddy animals to make reading more enjoyable and fun. The program is designed to help readers on all levels. All students benefit from reading aloud to practice their fluency and further stregthen their confidence in reading. The reading buddy provides a gentle, non-threatening, comforting listener. The new website was created in WordPress to allow the small non-profit to update its own web content and post blog articles. The website includes pictures of the reading buddies, information about volunteering, and online reading buddy and volunteer applications. Visit their website at bentleysbuddies.com. We’re excited about our most recent website launch for Civicus Planning, an Indianapolis urban planning company. 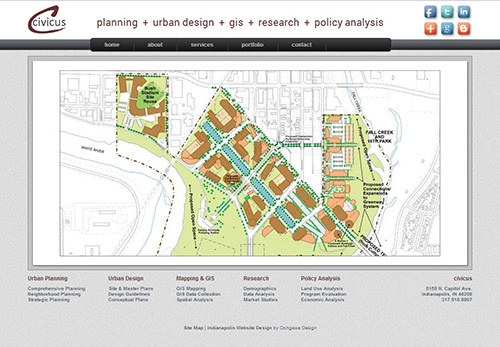 Civicus Planning provides planning, urban design, mapping & GIS, research, policy analysis, and website design services. “Civicus” is Latin, meaning “of or pertaining to citizens, civil, civic,” which reinforces their belief in collaborative, participatory planning and government. Their recently designed website showcases a portfolio of their urban planning work. 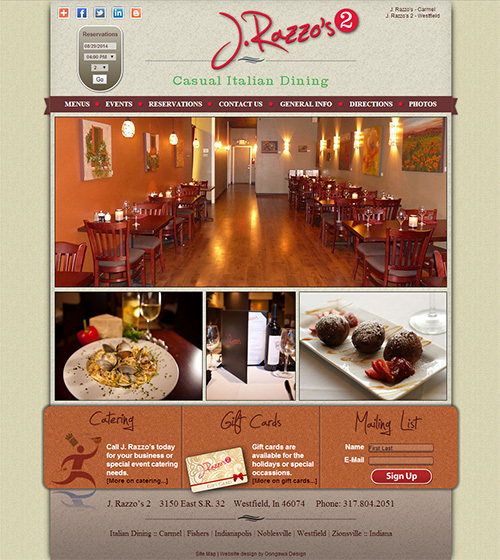 Oongawa design recently launched a new website for J. Razzo’s Italian Restaurant & Wine Bar. Located in Carmel, Indiana, their emphasis is on quality, from buying only the best ingredients – domestic and imported – to serving the best food at a reasonable price with friendly, attentive service. Their sauces, dressings, and some of their pasta and breads are made fresh daily in their kitchen. The recently designed J. Razzo’s website includes full-text lunch, dinner, dessert, wine and catering menus, social media integration, custom OpenTable reservation integration and custom Google map integration. The website also provides restaurant and photos, and information about special events, specials, gift cards, and catering. 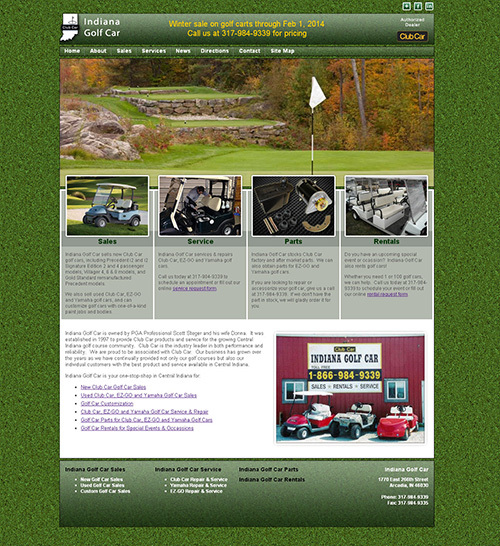 The recently redesigned Indiana Golf Car website is now online. Indiana Golf Car is an Arcadia Indiana Golf Car Company that sells, services and repairs new, used and custom golf cars. They also provide golf car rentals and sell golf car parts. The new website includes information on new Club Car golf cars, used and custom golf car listings, an online service request form, an online rental reservation form, and Facebook and LinkedIn social media integration. 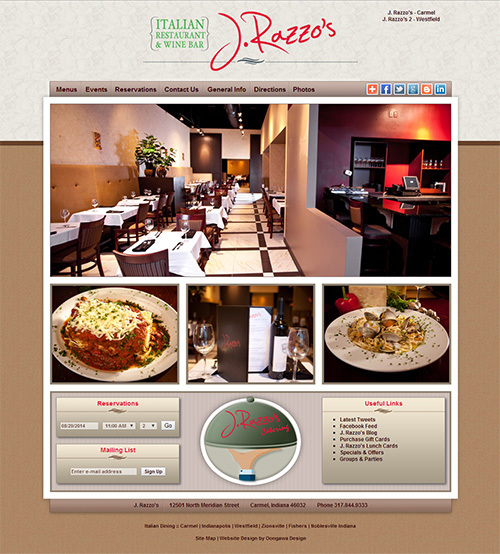 We are pleased to announce the release of a new website for J. Razzo’s 2 Italian Restaurant in Westfield, Indiana. J. Razzo’s 2 is an offspring of the successful J. Razzo’s Italian Restaurant & Wine Bar in Carmel, Indiana. Just like the Mama restaurant, J. Razzo’s 2 places an emphasis on fresh, quality, domestic and imported ingredients. Their goal is to serve the best food at a reasonable price with friendly, attentive service. Their sauces, dressings, and some of their pasta and breads are made fresh daily in their kitchen. The website includes lunch, dinner, dessert, wine and catering menus, social media integration, custom OpenTable reservation integration and custom Google map integration. The website also provides information about special events, specials, gift cards, catering, and restaurant and food photos. Visit their website at www.JRazzos2.com. 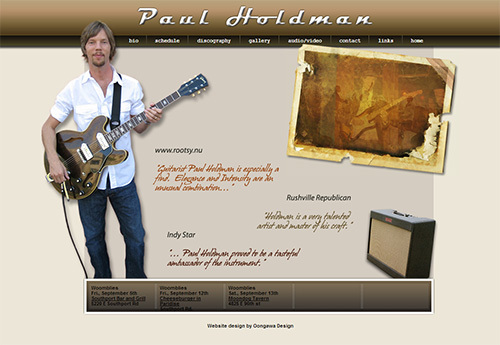 Oongawa Design recently created a new website for guitarist and songwriter Paul Holdman. Based in Indianapolis, Paul’s musical styles range from Blues, Rock, Soul, and Rockabilly to Surf, Country and Jazz. His website provides a bio, discography, an online schedule and photo gallery. The website also includes a custom YouTube video page and allows the artist to update his own music schedule. We recently redesigned the Neomorphis website. Neomorphis is the hosting arm of Oongawa Design and also offers Indianapolis web design and development services. The website highlights their services and provides a web design portfolio. The new website is responsive, meaning that it adapts automatically to different devices. The website can be viewed on desktop computers, tablets and mobile devices. 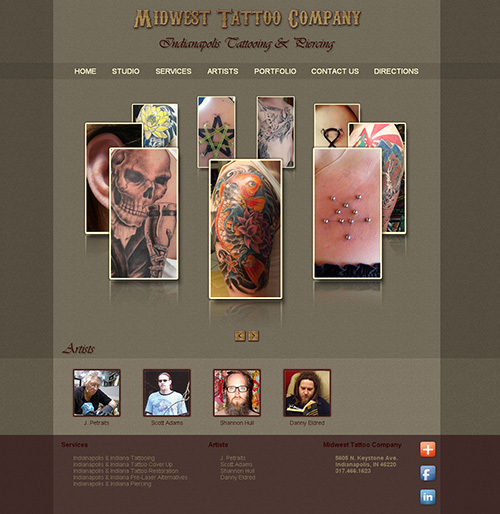 Oongawa Design recently redesigned Midwest Tattoo Company’s website. Midwest Tattoo Company is an Indianapolis Tattoo Company that offers tattooing, piercing and tattoo cover-up services. Their new website serves as a portfolio to showcase their work. © 1998-2014 Oongawa Design, Inc.